Darrelle Revis (left) is headed to his fifth Pro Bowl, and Gerald McCoy (right) is headed to his second. Cornerback Darrelle Revis and defensive tackle Gerald McCoy will return to the Pro Bowl. The NFL announced Friday night that Revis and McCoy will represent the Tampa Bay Buccaneers at the league’s all-star event, which will be held 7 p.m. Jan. 26 at Aloha Stadium in Honolulu. Revis, 28, will appear in his fifth Pro Bowl, his first since 2011. McCoy, 25, will appear in his second, after appearing in his first following last season, and he becomes the first Bucs player to make the Pro Bowl in consecutive campaigns since former linebacker Derrick Brooks and former defensive back Ronde Barber achieved the feat after the 2006 season. "I’m honored," McCoy said in a conference call. "Guys really have been taking care of me. It’s difficult to make it to the Pro Bowl once, but to make it back-to-back years, that’s pretty tough, especially coming off of back-to-back injuries. … It’s definitely an honor. I’m just happy that the fans and the coaches and the players think this highly of me." 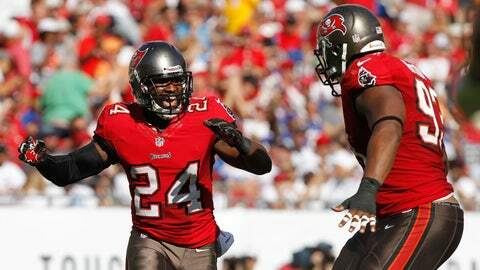 Revis, traded by the New York Jets last April, has 47 tackles and two interceptions in his first season with the Bucs. He has played at less-than-full health most of the fall after recovery from surgery to repair a torn ACL in his left knee. Still, he has become one of the Bucs’ defensive staples. "It’s always an honor to get selected to the Pro Bowl and I’m looking forward to participating in the new format," Revis said in a release. "While I still believe I’m capable of more, this selection shows that people around the league respect the way I prepare and play." McCoy, meanwhile, has 48 tackles and a career-high nine sacks. He’s one sack short of becoming the first Bucs player to record at least 10 sacks in a season since former defensive end Simeon Rice did so in 2005. McCoy is the fourth Bucs defensive lineman to earn multiple Pro Bowl berths, joining former defensive tackle Warren Sapp (seven), former defensive end Lee Roy Selmon (six) and Rice (two). The biggest Pro Bowl surprise, from Tampa Bay’s perspective, was the absence of linebacker Lavonte David from the roster. David, a former second-round pick in his second season, has become one of the league’s most effective at his position. He’s the Bucs’ leader in tackles (137) and interceptions (five) this season, and he gained respect throughout the NFL for his ball-hawking skills (he has two forced fumbles and one fumble recovery). Perhaps being part of a 4-11 team hurt his cause. But for whatever reason, his name was missing from the Pro Bowl roster reveal. "I don’t like that at all," McCoy said of David’s absence from the roster. "I told him, and I don’t mind saying it publicly or whatever, if I could give back my opportunity to go and give it to him, I would. That’s my little brother, and he’s more than deserving. I don’t think it’s fair. I just think he kind of snubbed. Ain’t no ‘kind of’ about it – he got snubbed."